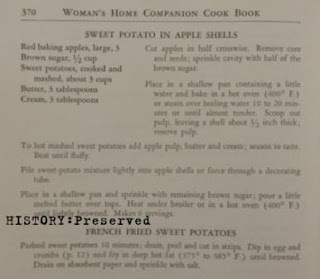 This week's recipe is for Sweet Potato in Apple Shells from the 1946 Woman's Home Companion Cook Book. Doesn't that sound interesting? The recipe looks really yummy, and it would make a perfect fall harvest side dish! Autumn Wartime Recipes & Food - It's Back! 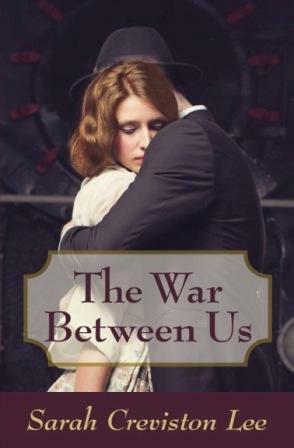 I was thinking about what I wanted to do next on the ol' blog, and I couldn't stop thinking about how much I enjoyed my Autumn Wartime series. So, I thought, why not do it again? 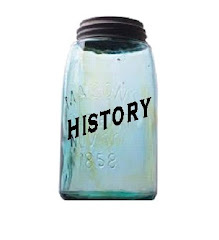 I'll be changing it up though to better fit my current life. Instead of posting every day for a month, this time I'll be posting once a week for the whole season. Yay! Our first week's recipe of the series is Spiced-Apple-And-Grapefruit Salad. 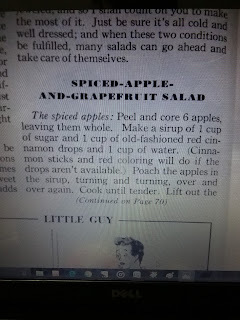 This is a great salad idea for these early autumn days that can still be rather warm, at least here in Maryland. The spice paired with the grapefruit is interesting, especially with the baked apple being chilled. Pardon the photo quality. I only have my phone's internet available right now. Come back next week for more 1940s autumn food inspiration!